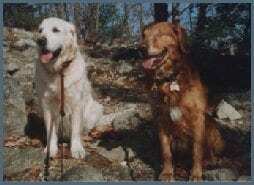 Some Beneficiaries - Yankee Golden Retriever Rescue, Inc. In 1996, Robert and Barbara J. established YGRR’s Look Beyond Time Fund with a very large donation. The stated purpose of the Fund was to provide financial support for the care of senior Rescue Goldens, those age eight and older. Barbara and Robert wanted to make certain that YGRR would never have to turn away a senior Golden because the organization could not afford to keep the dog for as long as necessary to find him or her a home. With their gift, they also wanted to encourage others to adopt seniors as they had done and to “Look Beyond” the lesser amount of time one would have with a senior dog. In 1997, Dave V. added his most generous donation and the purpose of the Fund was expanded to include support for the care of Special Needs Rescue Goldens. Special needs Goldens are defined as those who have medical conditions that will be expensive to treat and those with medical or behavioral conditions that render the dog more challenging to place. Additional gifts to the Fund through the years have granted us the ability to admit senior Goldens and special needs Goldens without hesitation. 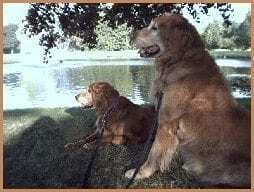 Typically both senior and special needs Rescue Goldens stay at Riverview much longer than “regular” Rescue Goldens. Because of the Fund, we can admit dogs in those categories without risk of diminishing the care of “regular” Rescue Goldens. 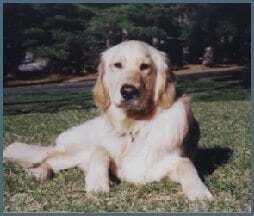 The Fund permits us to keep senior Goldens for how ever long it takes to find their new families. Many of our readers are familiar with BJ and Kelly, an eleven year-old senior, special needs Golden couple. They were surrendered to YGRR in September of 2001 when their lifelong owners divorced and no one could take care of the dogs. Not only were they seniors, they were lifelong companions who had to stay together and Kelly was also diabetic and blind. It took nine months, but BJ and Kelly found their forever home in June, 2002. I wanted to send you a picture of BJ & Kelly. I had a hard time getting them to sit still together last evening. As you can see from this photo, they have their attention on something else. And yes, they are doing great! They’re a big hit with my family and the neighborhood. We go for a walk to the park in the picture every day. I have actually seen Kelly almost run and pull me when she’s on the scent of a squirrel! They’re a big hit with the folks at the vet’s office as well. Kelly has lost a few pounds and has just completed her second blood glucose test — we’ve lowered her insulin by one unit so far. The raw diet is going well and I have adjusted BJ’s diet a bit so he gets some too. The canine chiropractor that I took Gus to runs a co-op that orders from Oma’s Pride so I’ve joined that and we order monthly. Overall, Kelly seems to be feeling very independent and confident (sometimes too confident) on the leash. She is definitely The Boss. BJ continues to come to Kelly’s rescue if she starts barking when she smells another dog. But he is clearly a snuggler and likes to be with me whenever he can. He is an absolute delight on the leash when I take him by himself and he doesn’t seem as anxious if he sees another dog. He definitely eats better when he gets some of the good stuff that Kelly eats. Overall, BJ is a bit anxious — I suspect he wonders if this is permanent (I try to tell him that this is his home now) but he seems happy and isn’t shy about asking for attention (pushes his head in when someone is patting Kelly). They are great dogs and I feel like the lucky one. 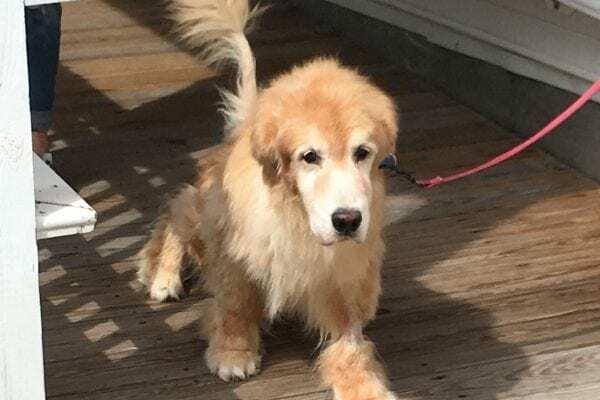 During the time that BJ and Kelly were with us, YGRR was able to provide rescue and adoption services to fifty other senior Goldens, thanks to the Look Beyond Time Fund. 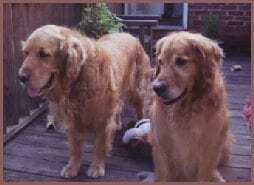 Among them were Barney and Bear, two nine and one half year old special needs Goldens. Barney’s owners surrendered him because they could not find anywhere to board him while they went to Florida for three months. We were told that none of the boarding kennels they contacted wanted to care for a blind senior for that length of time. When Barney arrived at YGRR’s veterinarian, it took no time for the doctor to determine that Barney was in a great deal of pain from the glaucoma in both of his eyes. Glaucoma in older dogs is often due to displacement of the lens of the eye so that the outflow of liquid from the eye is obstructed. Glaucoma may also occur because of blockage of the outflow tract (in the absence of a displaced lens). Fluid buildup within the eyeball results in a pressure increase that causes pain and eventually destroys the retina, causing blindness. Barney’s owners had told us they had medications for Barney’s eyes but they did not leave the medications when they left Barney. So our vet contacted the veterinary ophthalmologist who had been treating Barney to determine which medications he had prescribed. To her surprise the ophthalmologist told our vet that Barney had been scheduled for enucleation (removal of the eyeballs) but his owners had canceled the appointment when they decided to give him up. So it seemed that they knew their dog was in pain but they chose to turn him over to us rather than give him the surgery he needed. Painful glaucoma was not Barney’s only problem, however. In addition, he had four rotten teeth that had to be removed, he had infections in both ears and he was not being treated for hypothyroidism! We had both of Barney’s eyes removed and the lids sutured closed. He was a perfect patient and was very happy and confident after his surgery. We believe that he was pain-free for the first time in many years. While regaining his strength and recovering from the surgery, he captured the heart of a volunteer. I am a volunteer dog walker at YGRR who fell in love with this wonderful, spirited and sightless fellow. When I met Barney in January of 2002, he immediately fascinated me and touched my heart. After all he had been through at the age of 9 1/2, he was as confident and loving as any Golden could be. Barney has an 11 year old light Golden brother, Hank, whom he loves to take daily walks with as well as snuggle up and snooze with! This photo is of the two boys on top of a mountain at the Boy Scout Camp. As you can see, just because he has no sight doesn’t mean Barney isn’t up to the challenge of climbing mountains! I got the call from the YGRR transportation coordinator, informing me that a 9 year old “guy” needed a lift from a nearby veterinary clinic. He was a “senior, special needs” Golden with seizures. His owners had brought him in to be euthanized and the veterinarian convinced them to let him call YGRR instead. So, I went to give him a ride to one of YGRR’s collaborating veterinarians. I arrived at the clinic to pick up Bear and the technician went to get him. He ambled out of the back room, looking a little confused but very docile. The tech got very misty-eyed, gave him a kiss and told him to “have a good life.” She then told me that she would have adopted him herself, but she already had three dogs. I laughed and said I already have two dogs. So, on we went. Bear laid down in the back of my van and went to sleep. I could feel my heart melting as I looked at him resting. He was so trusting of the humans leading him around, and had no knowledge of the prior possibility of his demise. It seems his previous owners wanted to put him down because they were “tired of dealing with his seizures” and “he had a seizure in front of the children.” However, the clinic technician pointed out that his owners were not giving him his medications and were ignoring his medical needs. When we got to YGRR’s vet, Bear woke up and looked around, a little confused but still docile. He was a gentle giant. I had a hard time keeping my tears back as I turned him in to the clinic. I called the YGRR coordinator and left a message that the transport was completed. I also told her machine that, if nobody else wanted Bear, I would take him. In a one-hour transport, he had worked his way into my heart. I already had two senior Goldens — what’s one more? To make a long story shorter, Bear came home with me on May 4th. I brought my other two dogs and a human friend to Riverview to meet him, a little worried about my other male dog accepting him. They got along fine and we all piled into the van for the ride home. Bear had been on Phenobarbital for his seizures which his previous owners were giving him only sporadically. During his stays at the various vets and Riverview, Bear was on a very low dose — “ridiculously low,” as the examining vets and technicians had said. It was not nearly enough for his body weight, but he was not seizing. I was hopeful that he would not need medication after all. But, his first month was not easy. He had digestive problems and had three seizures, each one occurring about two weeks apart. He was very lethargic, almost comatose at times. One morning, I had to literally roll him off his dog bed to get him up and out. We paid many visits to my vet and did blood work and liver tests. I began to wonder if I had “bitten off more than I could chew.” Was Bear a very sick dog? But, gradually he recovered. We are now trying him on potassium bromide and he has not had a seizure in over a month. Bear (left) and Jackson: Bear’s energy level has returned to a very perky, friendly one, acting many years younger than his 9 1/2. Bear is completely a family member. He gets along very well with my other dogs, does not fight for toys and now anticipates the daily routines. He is completely devoted to me and follows me from room to room. He sleeps on his orthopedic bed next to my bed. He plays with a tennis ball endlessly, which he occasionally drops into his water dish, just to make things interesting. He will often”throw” it at me if I’m not getting the hint quickly enough. At least once a day he does something that makes me laugh out loud. When we drive in the van over to the state park for a swim, he jumps in the back seat and lies down on the floor, just as he did the very first time I picked him up. When we get to the park, he walks around in the water, often lying down in the stream to cool his belly, and then jumps up and races around like a puppy. He is a very, very happy, loving dog. If he were to die tomorrow, I would be devastated but would have no regrets about taking the chance and adopting him. The YGRR saying of “Look Beyond Time” is very appropriate. This senior dog has completely and absolutely paid me back with laughter and love tenfold, in just two months. The LBT Fund also provides the very best veterinary care and lengthy recuperation for Rescue Goldens with extensive and expensive medical needs. Two beneficiaries of the Fund in 2001 were at the opposite end of the age spectrum from BJ and Kelly — puppies! 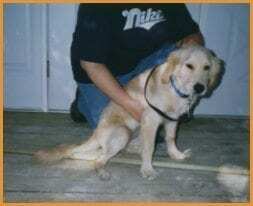 In September of 2001, YGRR admitted a four month old Golden who had been returned to his breeder because he had failed the physical examination necessary for acceptance as a service dog trainee. Alex failed because he had dislocation of the right knee (luxating patella) and dysplasia in both hips. Both hip dysplasia and patellar luxation are hereditary diseases — due to an individual animal’s genetic constitution. Many hereditary skeletal diseases are of interest because of the deleterious effects of the resulting abnormalities. Patellar luxation and hip dysplasia are just two of more than forty recognized or strongly suspected genetic skeletal diseases of dogs. In hip dysplasia, the “ball and socket” joints of the hips develop abnormally. Either the sockets are too shallow, or the ligaments and/or muscles do not exert enough control over the movement of the joint, allowing the “ball” end of the thighbone (femur) to separate from the hip joint. Hip dysplasia is caused by a complex set of inherited traits where the pelvis doesn’t develop uniformly. Dysplastic dogs don’t have snug fit once the dog reaches maturity. The failure of the development of the hip joints may vary from slightly abnormal joints to complete joint dislocation. The poorly developed hip is frequently (but not always) painful, and interferes with proper gait and activity. Although hip dysplasia is caused primarily by a hereditary defect, the severity of the disease is influenced by rapid growth, overfeeding and excessive exercise. Alex was in pain from both the hips and the knee to the point that he was practically walking on only his two front legs. Thanks to the Look Beyond Time Fund, YGRR was able to provide Alex with the services of a board certified surgeon for both conditions. When a knee is dislocated in a dog, the kneecap moves to the inside of the leg so that the muscles of the leg responsible for straightening the knee are no longer in alignment. Depending on the severity of the condition, the problem can result in little or no lameness or can cause complete nonuse of the leg. At surgery, the patella (kneecap) is moved back into its normal position and fixed firmly in place. Although it was expensive, the procedure for the patella was a straightforward surgery. Alex at Riverview before his surgery: For the hip dysplasia Alex was able to have a new, low cost surgical procedure called juvenile pubic symphysiodesis which changes the angle of the hip joints. (The procedure cannot be performed on dogs older than five months.) The surgery uses electrocautery via an incision in the groin. The procedure fuses the lower pelvic bone and changes the hip’s growth pattern. It improves the hip position by turning the fused pubis into a hinge. Limited by the hinge, the hip socket swivels to a different angle as it grows. As the dog matures, the new angle helps to cup the ball of the leg bone in the hip socket. Postoperative care following joint surgery requires a judicious balance between rest and healing on the one hand, and encouragement of some motion in the joint on the other. The joint tissues and the fluid bathing the joint require motion and weight-bearing to remain healthy. Non-use of a joint will result in deterioration of the joint cartilage. Too much rest following surgery may speed healing of the surgical site, but can also result in loss of joint function. Although Alex’s recuperation from the JPS procedure for his hips could have been quick, the doctor prescribed six weeks of quiet and rest for his recovery from the knee surgery. He was only permitted to go outside briefly to relieve himself and then back inside. Once the six weeks were past, the staff at Riverview began to give him physical therapy by walking him gently around the Riverview property and inside our Training Building in inclement weather. Leash walking in a slow, straight line is an excellent exercise for a pet following surgery. By walking, the recovering dog is forced to use all four legs – in contrast to loping, wherein the dog can “cheat” by skipping on the affected limb and thus inadequately exercising the repaired joint. Once the skin incision has healed, swimming can provide an excellent and safe way to exercise a healing joint. Swimming provides motion without excessive weight-bearing, and dogs cannot swim without using all four legs. It is very important to remember that swimming is hard exercise. It is best to begin by having the dog swim for only short amounts of time over relatively short distances. Unfortunately, Alex had his surgery after the pool at Riverview had been closed for the winter so this option was not available to him. Joint injuries may require several weeks of controlled exercise before the dog is allowed to return to its normal level of activity. Owners should not be impatient and attempt to rush the recovery, otherwise the healing may be delayed even longer. For this reason, Alex was only handled by the staff until his recovery was well underway. Once he started walking with the dog walking volunteers, Alex met his new owner. Preventing Hip DysplasiaSince hip dysplasia is an inherited condition, the way to prevent it is to avoid breeding dogs with the condition. To do so, breeders can have their male and female dogs evaluated. Many experts now prefer the PennHip (University of Pennsylvania Hip Improvement Program) evaluation to the OFA (Orthopedic Foundation of America). “PennHip is much more accurate than OFA,” said Dr. R. Tass Dueland, a veterinary surgeon. PennHip uses a more objective measurement to interpret hip joints than OFA. It can be used to measure the hips of puppies as young as 16 weeks, compared to the standard OFA technique of 2 years of age. Breeders can use PennHip evaluations to select breeding stock with the tightest hips. > Alex relaxing at home: It has been almost four years since I took the orientation program required for dog walkers and swimmers at YGRR. I thought that since I had an eight year old golden already, there probably wasn’t too much to know about walking these dogs. I quickly learned that dogs finding themselves in need of “rescue” are not always going to be like dogs that have been raised in caring homes since puppy hood. I don’t know how long Alex had been at Riverview, but because of his surgery, in his early days, he was cared for only by the staff. I remember seeing a very calm little blond boy gazing at me every time I would walk another dog from his area. Eventually, as he recovered, volunteers were able to take Alex for very easy 10 minute walks. Right after the New Year, I had the opportunity to play with Alex one afternoon while at Riverview, and it was then that Alex adopted me. I had reservations about adopting any dog because my Golden Tucker is now twelve and I was concerned as to whether or not he could adapt to a new “sibling”. I arranged with Sue and Allyson to bring Tucker to Riverview to meet Alex to see if the two would get along. Tucker spent his time vying for the attention between Allyson, my husband Ken and myself, which was what we expected. Alex is a pretty flexible little guy and that seemed OK with him as long as he was able to get his share of the action. I brought Alex home a week later and they have adjusted to each other very quickly. Alex is an unusually calm and very smart little boy. Not only is the old dog teaching the young, the young is also teaching the old. Tucker has never ridden in the car very well, but with Alex sitting calmly next to him, he is much better while riding. Alex already comes when called, so Tucker comes now too! Since Tucker swims so much, we expect he will be able to teach Alex his water ways. In retrospect, I think Alex’s age is a perfect mix with an older dog. Rather than having a very young nippy puppy or trying to acclimate two older dogs, both of whom would be set in their ways, we have a young dog who is flexible and goes with the flow. We love Alex and he is the best addition to our family that we ever could have imagined. 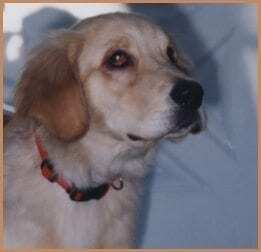 In early 2002, YGRR received a call from the brokenhearted owners of a five month old Golden named Zoe. Despite having consulted with a board certified specialist and having spent close to two thousand dollars trying to heal their puppy, Zoe’s owners had not been successful. Zoe suffered from a painful conjunctivitis eye condition for which the specialist could not find a cause and could not cure. Zoe’s owners hoped that YGRR had the financial resources to continue and would be able to find another specialist who could help her. On Zoe’s arrival at one of our collaborating veterinarians, routine blood tests were run. The results indicated that Zoe’s liver was working overtime and the veterinarian became concerned about damage to her other organs because of the many medications she was being given. Zoe was taken off the virtual pharmacy of drugs her owners had been told to put in her eyes and give her orally for the past several months. Her little body was almost toxic because of the tremendous assault of all the medications and for two weeks all the vet “ordered” was to allow nature to cleanse her system while he treated her pain. It was a difficult time because, until her body was free of all the drugs, we could not help Zoe. For two weeks Zoe had to wear her Elizabethan collar round the clock so she would not rub or scratch her eye. Zoe’s damaged eye before surgery: While her body was being “cleansed,” we took Zoe to a veterinary ophthalmologist where her condition was diagnosed as “chronic, diffuse conjunctivitis with dystrophic calcification of the right eye.” This is widespread inflammation of the conjunctiva (white surface of the eyeball) with a build up of calcium plaque deposits. Ironically, the build up had been caused by one of the ophthalmic ointments that had been prescribed to treat the (original) conjunctivitis. Even veterinarians agree that the lesson to be taken from Zoe’s case is that if you are not satisfied with the answers you are given by a veterinarian — even a board certified specialist — seek another opinion. Zoe’s first owners sought out the best help they could find and yet, that specialist was not able to heal her. If YGRR did not have the Look Beyond Time Fund, we might not have been able to take Zoe to a different specialist. She might have been euthanized — to free her from pain — simply because the doctor who was treating had never seen her very rare condition. 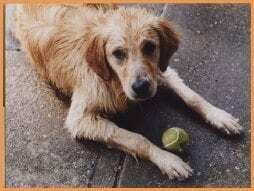 It’s been almost a year since we first contacted Yankee Golden Retriever Rescue with the hope of adopting a Golden. Napa, our 5-year-old female Golden was a delight, however she seemed very lonely and we decided she needed a playmate. During the interview process, we all concluded that since Napa is so shy, she would be best suited with a puppy that Napa could “mother.” We were advised that the wait could be quite long, as YGRR generally has older adoptees available. Months went by and our hopes dimmed. Then, on a beautiful day in March, we got a call that 5-month-old Zoe was available and might be a perfect match for our family. Yankee asked that the entire family, including Napa, come out to meet Zoe to determine if she would be a good match for us. Since Kendrah and Ryan were away at college, they were not able to join us that day. Zoe came into the room with a toy in her mouth and growling at the same time. Sue, one of YGRR’s staff members told us not to be alarmed at her”puppy growls;” it was Zoe’s way of telling us that she was proud of herself for retrieving and bringing her toy to us! Needless to say, it was love at first sight! We played with Zoe for several minutes and realized that although she was a playful puppy, Zoe was also very gentle and sweet, just like Napa. Now it was time to introduce the girls to one another. As we brought Napa into the room, Zoe’s eyes lit up as if to say “wow, a new friend!”! Napa, on the other hand, ran behind Jordanne to hide. She was afraid of this beautiful little puppy! We left them alone and soon they were trading sniffs and wagging tails and generally romping around. Abby had an eye medical problem that was due to a very rare drug related reaction to a normal eye conjunctivitis issue. Her eye looked a little funny, but her personality far out weighed that issue. Coming from YGRR, we knew that she received the best of care, both medically and personally. It’s hard to believe that six months has passed. Everyday, “the girls” start their day with a frog hunt. In the back yard, we have a koy fish pond where a few frogs happily live and swim and a large inground pool for the dogs and the humans. One or two of the frogs seem to like the pool, as well. Every morning the dogs quickly run to the edge of the pool, eyeing the bottom, while pacing back and forth. Suddenly there’s a splash and we know they’ve found a frog. One of them will carry the frog out of the pool (in her mouth), gently put it down on the deck, sit there, watch the frog jump back in and start over again. Scott will rescue the frog, put it back into the pond, but by the next morning the dumb frog is back in the pool and the ritual begins again. Abby is an exceptional swimmer and is the first dog that we’ve ever seen swim underwater. She dives in, just like Napa, however if she sees a toy on the bottom of the pool, she will dive down two to three feet to retrieve it. She also loves putting her nose in the water and blowing out to make bubbles! “The girls” play all day long like a couple of 4-week-old puppies. They run and tumble and roll around and tug at the same toy and are generally having a ball. How can we say thank you for making our family more complete. I guess we can tell you how happy we all are and how happy Abby and Napa are together. Please know that we deeply appreciate your hard work and dedication in protecting these extraordinary dogs! BJ and Kelly, Barney, Bear, Alex and Zoe are all very grateful for the donations to the Look Beyond Time Fund, which made their care possible. Thank you to Robert, Barbara and Dave for providing the leadership that established the Fund. As YGRR becomes more well known, we find that more and more dogs with special needs come our way. Thankfully, because of your support, we are able to meet the challenge.